Girls Dress Pattern / Twirly Skirt / Pocket Full of Posies / Flower Pocket / Sleeveless / Ruffle Neck / Addyson from Trisha's Treasures. 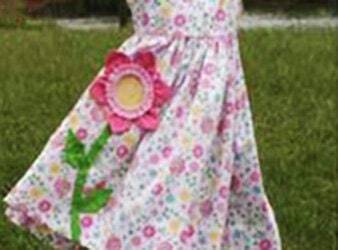 The“Addyson” pattern, aka, “Pocket Full of Posies”, is a dress that has “twirl” factor. And, won’t she be surprised to learn that the flower is a pocket. The scooped neckline is finished with a bias binding and a ruffle. Trisha's Treasures are designed by Trisha Smith.